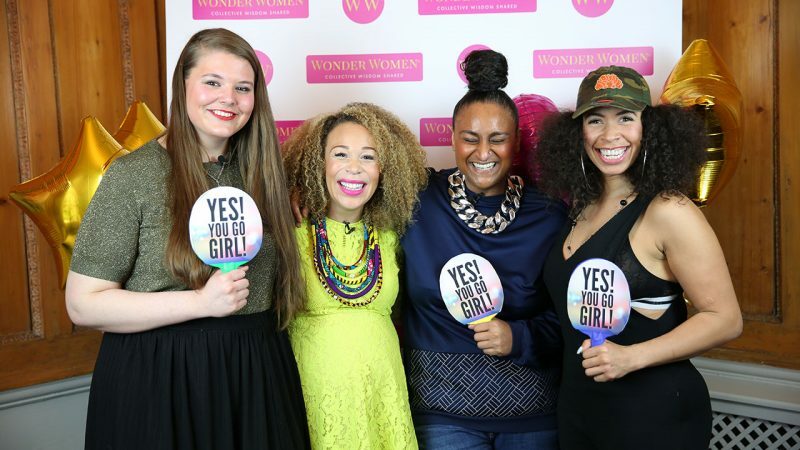 Tell us more about Wonder Women TV and what you have set out to do? I set up Wonder Women because I felt there was a lack of positive female role models being championed online. Through the work that I did with the Media Trust and mentoring young people, I’d hear time and time again that people weren’t aware of the roles available in different industries. I’ve worked in media since 2004 so I thought to use my network of contacts I’d built up working in television, entertainment and music. I wanted to bring the people that are doing amazing in those industries and share their stories with people online to inspire them. What have been your favourite episodes of WWTV? In each episode there are some pearls of wisdom, and because my background is in television I thought I would naturally steer towards that. But with the tech episode, that was quite refreshing because tech is very new; it’s very innovative and ever-changing. I’d say tech or telly was my favourite but they all said amazing things and all the women were great! MBS: From your viewpoint, has the representation of women in tech improved in recent years? There are tonnes more work to be done in tech, especially in STEM (science, technology, engineering, mathematics) subjects because historically the nature of those subjects have been predominantly male. I think in the past ten years, technology has become a lot sexier. It’s been deemed as a much more creative industry. People are creating their own content and it’s an industry that is so much more vibrant. I think things are changing, but the industry does have a massive problem with retaining female talent. How do you think retaining talent can be improved? The companies themselves need things in place as a business to support women when they choose to leave work and have families. A lot of industries don’t have these flexible policies which makes is hard for women to climb the corporate ladder. Many tech companies have pledged that by 2020 they aim to create thousands more roles for women. Things like that are really important; it opens doors to let more women in. Sky just announced that they were launching a new scholarship to get more people into STEM subjects. Initiatives like that are really important. It shows the industry is serious about making a difference in terms of diversity in those subjects. What do you think about the visibility of women in media? In television there is a shocking amount of women who leave the industry at around the age of 35. It’s because at that age it’s quite common for women to start a family. It’s a shame because as an industry you’re losing a huge chunk of creative talent and experience. We do very well to a certain level but then there’s a huge drop-off rate when it comes to having children. We need to take note and see the value of what women bring to the industry. What are some of the challenges of working in media? You do hit some brick walls; it’s about finding out how you overcome that mid-senior level challenge. That’s what Wonder Women was about. Having a varied panel of women, that were genuinely diverse to show the difference in challenges you can experience in the industry. Young people may not have the right contacts because they may have not been to many networking events, so getting that first opportunity could be quite challenging. For the older women who are more established in their career, their challenge might be climbing to that next level because senior people at the top don’t move on so the opportunities don’t come up. Which 5 women in media would she invite to a dinner party? I would definitely have Ava DuVernay, the film director, because I think she’s doing amazing things and I think you should watch her documentary ‘13TH’. I’d have Davina McCall, the presenter, who has been a trailblazer for years! Arianna Huffington who runs the Huffington Post. She wrote a really good book called ‘Thrive’; she’s been there, done that and got the t-shirt. And you can’t not have Oprah and Viola Davis. I’ve always wanted to work in television and become a presenter. But I think if wasn’t, I’d probably be a dancer. I feel like I was a dancer in a previous life! What has been the highlight or proudest moment in your career to date? It has been shooting Wonder Women. It had been an idea of mine for a couple of years; I’d held it close to my chest and I’m really proud of that. I had committed to shooting this show whilst having a baby. It’s been the proudest thing I’ve done so far now. When I look at what I did whilst heavily pregnant, I know I’ve made it happen. Is it hard to balance being a mother and freelancing in the television industry? I think it gives you more freedom because you get to pick and choose your weeks. I work that around my family but equally, I have a very supportive partner. We’re a really good team but I think freelance is easier because you are your own boss. Granted there are quiet times in the industry, but you have to be tenacious, organised and positive. If you want to work in this industry, you’ve really got to love it. What’s the future for Wonder Women TV? The future is absolutely positively female. There are lots of exciting things coming up that we will share with you in the next few months. Thanks to Ria for speaking with us. To find out more and join the Wonder Women community, visit www.wonderwomentv.com now. Follow @Scene_TV on Twitter and join the mailing list here for the latest news and opportunities.